I have treated firefighters for the past 15 years, blogged about their increased risk of cancer and cardiovascular disease and now about their obesity associated mortality. In simple terms, firefighters are exposed to numerous combustible chemicals that can be breathed in and absorbed through the skin. They body strives to function so these occupational exposures and noxious chemicals go into the bloodstream and are stored in fat tissue. The body produces more fat cells in relationship to the number and amount of chemicals that are stored in tissue. This is a clever and protective way of keeping the chemicals in storage and away from the vital organs for better physiological function. Exposure to chemicals is linked to weight gain, higher BMI, obesity and diabetes. Do obese and overweight firefighters get weight loss advice from their primary care physicians? The answer is no in a recent study. They would if they saw a naturopathic physician because we understand the environmental implications of exposure and subsequent protective weight gain from those exposures. Even worse, the study found that younger firefighters were less likely to receive weight loss advice than their older peers. "Rates of obesity and overweight are higher among firefighters than the general public and cardiovascular events are the leading cause of line-of-duty deaths." Not addressing weight gain in younger firefighters highlights a missed opportunity to address obesity-related complications. 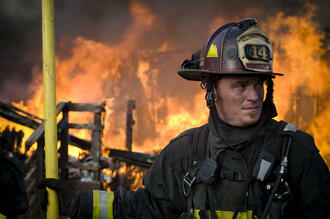 Obesity increases a firefighter's risk for injury, disability and mortality. At Second Nature we address the root cause of obesity, the risks of obesity and include realistic treatment protocols to reduce weight gain. Diet, environmental exposures and exercise are part of every discussion. I feel compelled to talk about these issues with first responders because so many lives are held in the balance by them in an emergency.